Brandon Negrich started his business when he was 18. He’s always been a motivated person and knew he wanted to start his own business from a young age. For Brandon, it began when he started doing tree removal at the age of 15. After seeing a need for it in Central Florida, he officially started Team Negrich Landscaping. 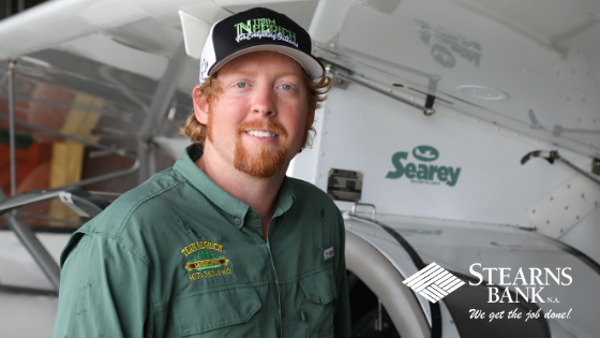 Brandon most recently financed an amphibious airplane with Stearns Bank so it can be easier for him to survey the land his company is about to work on. Team Negrich was referred to Stearns Bank from a colleague within the tree removal industry. Brandon was going to pay cash for an older bucket truck, but decided financing was the best way to go. He decided to try out Stearns Bank. He hasn’t worked with any other financial institution since then. “My colleague was amazed by how easy Stearns Bank was to work with and how on the ball they were. We both came away so impressed with how Stearns Bank works and how efficient they are,” Brandon said. Brandon feels he can rely on Stearns Bank to get him the equipment he needs whenever he calls. “I’ve spoken with Stearns Bank when I’m getting on and off of airplanes and they are always ready to hit the button to get in touch with me,” Brandon said. “Stearns Bank is where it’s at - they are on the ball.